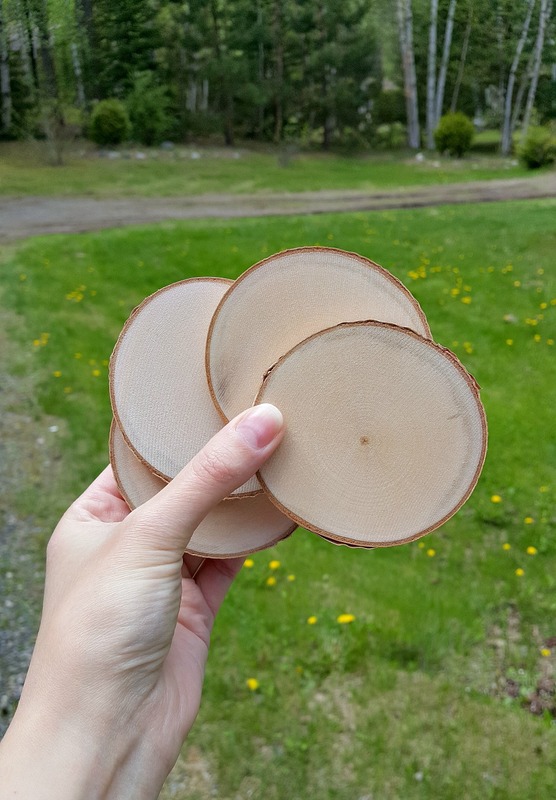 These “dipped” DIY birch slice coasters serve an important purpose in my DIY life. See, I have a spray painting confession that you might not expect from an avid DIYer: I have the tendency to rush my spray painting jobs. Too often I’m so antsy to be done and see the finished project, that I don’t wait long enough between coats or I apply some coats too thickly. I’ve had dripping and sagging problems as a result. This is such a rookie problem, I’m totally ashamed. BUT – I have solution that’s worked well for me the last couple of years: having smaller spray painting projects on the go at the same time! I just need to keep my hands busy. So while I was recently spray painting a fire pit Hubby welded (it’s so gorgeous), I distracted myself by applying the topcoat to an Ikea hack we stained grey (details soon!) and whipping up these “dipped” DIY birch slice coasters as well. With three projects on the go at once, I was occupied enough to allow my projects time to dry in between coats. As an added bonus, we now have this adorable set of DIY birch slice coasters! In our allotment of firewood this year, most of our logs were split but we did have a few whole birch logs that I squirreled away for crafts. But you could easily buy all of the supplies for these DIY birch slice coasters online as well, and I’ve linked to everything below. When my friend Ashley and I made her wood burned birch slice ornaments, we left all of the birch bark on, which you can do, but for coasters I just didn’t want too many loose bits. Then I taped off half of each birch slice coaster with a good painter’s tape. I really had to press down on the tape with my fingernail to get it to adhere to the uneven wood surface. I propped each coaster up with a rock and gave it a blast of spray paint, including Rust-Oleum Ocean Mist (left over from the candle holders I painted for my bottle brush tree mantlescape), Rust-Oleum Harbor Blue (which ended up not working for my painted terracotta planters), and dribs and drabs of different silvers, gold, and copper (the latter is actually Rust-Oleum High Heat Enamel Paint in Copper). To seal them – probably the only step that really needs explaining – I lightly coated each handmade birch slice coaster with three thin coats of my newest favorite product, Watco Spray Lacquer, which is such a great alternative to laboriously brushing on a clear coat. Since trying those wood burned wood slice ornaments, I’m really on the birch slice craft bandwagon. The materials are cheap and I’m two for two finding super easy projects to make with birch wood. Do you think you’d make these “dipped” DIY birch slice coasters? If you do, I’d love to see them! If you’re looking for more birch slice coaster ideas, check out my insanely adorable Komondor stamped birch slice coasters and my orange “slice” birch coasters too. Don’t forget to take a peek at the wood burned birch slice ornaments I mentioned. Love these Tanya. I'm thinking Christmas gifts to make. Your explanations are clear and to the point, no fiddly stuff in between to confuse a novice. Thank you! I'm so happy you like my tutorials :)It's funny, while I was painting these I realized I had a rogue red can of spray paint in my cabinet and I thought these would have been cute for Christmas – or even Canada Day, if I'd done red + white!